Bond buyers are piling into the telco’s record $49 bln debt sale. A 10-year yield above 5 pct and an investment-grade rating make it appealing. A big part of the lure, though, is the creation of a supersized, super-liquid benchmark. It’s an offer that just can’t be refused. Men are silhouetted against a video screen with Vodafone and Verizon texts as they pose with Blackberry Q10 and Samsung Galaxy S3 in this photo illustration taken in the central Bosnian town of Zenica, September 3, 2013. 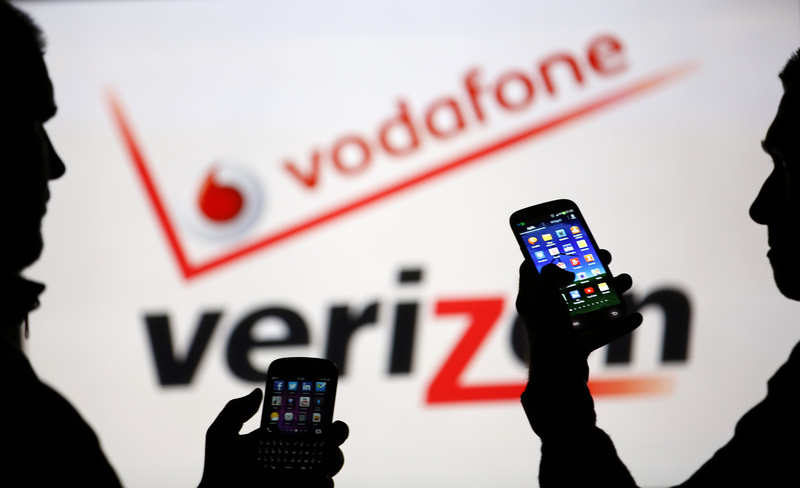 Verizon Communications launched a $49 billion eight-tranche bond on Sept. 11 that will partly finance the $130 billion buyout of its wireless operations from Vodafone, setting a new record for the largest ever corporate bond. The final size was at the top end of the $45-$49 billion range that market sources expected following demand in excess of $100 billion. That eliminated the need for the company to tap the euro and sterling market, as originally planned, IFR reported. The bond issue will partly refinance a $61 billion one-year bridge loan Verizon secured to fund the Verizon Wireless acquisition. The rest of the bridge will be replaced with about $12 billion of three and five-year term loans. The deal eclipses Apple’s $17 billion offering in April, currently the largest corporate bond issue on record.